As we continue working our way through Psalm 149 in the beginning part of the service on the coming Lord's Day, we will find Psalm 149:5-9 convicting (alongside also James 4:4-6 and Romans 14:23). And thus, we will confess our sin together in the following words. May the Spirit help us to pray sincerely, softening our hearts to acknowledge before God the truth about our remaining sin! This honor have all His saints. Questions for Littles: Who saw Mary weeping in John 11:33? Whom else did He see weeping? What did He do in His Spirit? What did He ask in John 11:34? What did they answer? How did Jesus respond to their answer in John 11:35? What observation did the Jews make when He responded that way (John 11:36)? But what did some of them ask in John 11:37? What did Jesus do “again” in Himself in John 11:38? Where did He go? What did Jesus say to do in John 11:39? Who answered Him? What did she say? What does Jesus ask her about in John 11:40? What had He told her? What did they do in John 11:41? How does Jesus begin His prayer? What does Jesus say that He knows in John 11:42? Because of whom does He pray out loud the way that He does here? What does He want them to do? What does Jesus cry out in John 11:43? What does Lazarus do in John 11:44? What does he look like? What does Jesus say to do with him? In the Gospel reading this week, we see the great compassion of our Lord Jesus. Jesus cares about our pain. Perhaps we expect that Jesus will be moved by Mary’s weeping. After all, she is His friend, and we have already heard that He loves her. We are prone to forget that people like Mary (and ourselves) are fully deserving of Christ’s anger, not His sympathy. So the Spirit tells us that it was also the weeping of the Jews that moved Jesus to groan. The Jews?! Yes. The ones who had recently tried to stone Him, so that the apostles didn’t even want to come near Judea. Jesus responded to the sight of their tears by groaning in His Spirit (John 11:33). Jesus responded to the sound of their grieving voices with tears of His own! (John 11:34-35). Jesus also cares about our souls. It matters to Him that the John 11:36 Jews don’t see that Jesus’s groans and tears are for all of them, not just Lazarus. It matters to Him even that the more outwardly hostile Jews in John 11:37 are attacking Him instead of believing. He prays for them. He prays that they would believe. And He thanks God for hearing His prayers for them! Oh, what comfort is this—that the heart of our Lord Jesus in heaven is that heart that prayed for hard sinners even while He was on earth. Is He not there even now, praying for us that we would believe?! But believe what? John 11:40 hints at the answer. We must believe what Jesus says about Himself. “Did I not say to you?,” He asks Martha. And His speech to Martha has had the same effect on her soul as His speech to Lazarus has upon his body. She has believed what He said about Himself. His words did bring her soul to life, so that she believed that He is the Christ, the Son of God who is the Creator Himself that entered the cosmos. Jesus has also told you, dear reader, that if you believe you will see in Him the very glory of God! What are some things Jesus has said to you about Himself? Pray to believe them! Questions for Littles: In what manner does the apostle plead with the Corinthians not to receive the grace of God (2 Corinthians 6:1)? How (Who) makes the difference in how they receive it (2 Corinthians 6:2)? In addition to the plain speaking of the Word (chapters 4-5), what do 2 Corinthians 6:3-10 present as the apostolic strategy for appealing to this wayward congregation? What were they willing to have happen to themselves? How were they willing to be thought of if necessary? What does the apostle say is the actual problem that is making the Corinthians think little of the apostolic ministry (2 Corinthians 6:11-13)? What does 2 Corinthians 6:14-15 imply has caused this hard-heartedness toward the apostles? Upon whose fellowship and presence with them should the Corinthians be more focused (2 Corinthians 6:16)? What must they do, if they are going to value their fellowship with God (2 Corinthians 6:17)? What kind of fellowship is God offering to them (2 Corinthians 6:18)? What result should focusing upon fellowship with God produce (2 Corinthians 7:1)? In this week’s Epistle reading, the apostle continues the theme of how it is his hope in God alone for the Corinthians that has him determined to minister only in the way that God has commanded. He wants them to know one thing: he doesn’t care to be treated well or thought of well. He cares only to be faithful before God and an example of faithfulness before men—however they respond to it. This faithfulness leaves them without excuse, because it is not despising and hard-hearted. Rather, in the midst of purity and truth and holiness and righteousness, this faithfulness is also patient and sacrificial and kind and sincerely loving and humble. Let those who despise such things go ahead and despise us! The problem, however, was that the Corinthians did not want to be despised. They wanted badly to be accepted and admired. They wanted fellowship with the world. But biblical kindness to the world and fellowship with the world are actually incompatible! Biblical kindness comes from being the sons and daughters of God, who love their enemies in the way that Christ did—and you see how unpopular that made Jesus! This family resemblance comes not from fellowship with the world but rather from fellowship with God. How precious that God Himself dwells in us and walks among us! O that He would grant to us that we would treasure His precious fellowship! Then, rather than being sucked down to filthiness by the desire for the world’s friendship, we would be lifted up to holiness by delight in God’s fellowship! Whom do you need to be loving with a holiness that they might despise? What are the means by which the Lord has given us to grow in delighting in His fellowship? Click [here] for a PDF of tomorrow's prayer meeting folder. As you can see from the schedule on the folder, we have a brief devotional by which we seek for the Spirit to stir us up to prayer by the Scriptures, and then we simply pray together for an hour. The opening portion of our worship service this coming Lord's Day comes from Psalm 149:1-4. This Psalm highlights the Lord's pleasure in His people's assembly in the temple. It refers to the assembly of the saints, the location of Zion, the King (of kings! ), and the Levitical musicians' ministry that prefigured the current heavenly ministry of Christ as our Great High Priest. Questions for Littles: What did John see open in heaven in Revelation 4:1? What did the voice he heard sound like? What did the voice say? In what did he immediately find himself in Revelation 4:2? What did he see in heaven? With what words does he try to describe what he saw in Revelation 4:3? How many thrones were there altogether (cf. Revelation 4:4)? Who sat on the other 24? With what were they clothed? What did they have on their heads? 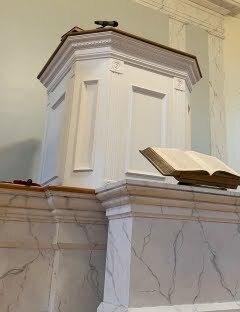 What was the great/main throne like in Revelation 4:5? What was in front of the throne’s platform (Revelation 4:6a)? What was on the throne’s platform (Revelation 4:6b)? How does verse 6 communicate that one purpose of the living creatures was to behold the throne? How does Revelation 4:7 communicate that the living creatures represent all living creatures? How does Revelation 4:8 communicate that the living creatures have the same ultimate purpose as the burning ones (seraphim) of Isaiah 6:1-10 (cf. John 12:40-41)? How often do they take a rest? What are they doing all this time without rest? What, specifically, do they say about God three times? And then what do they say about God? And then what? How does Revelation 4:9 begin? So, how often is Revelation 4:10 happening? Who falls down before Him who sits on the throne (verse 10)? What else do they do? What do they do with their crowns? Of what do they say the Lord is worthy (Revelation 4:11)? Why? This week’s Call to Worship, Prayer for Help, Song of Adoration, and Confession of Sin all came from Revelation 4:1-11. Here, we have a window into the praise of heaven, and what we find is the most amazing creatures (Revelation 4:8-9), and the most honored among glorified humanity (Revelation 4:10-11) praise God for things that are only true of God, and not even the most glorified creature. First, God is holy. He alone has holiness inherent to Himself. The only way anything else becomes holy is by association with Him, by being set apart unto Him or near Him. We should be amazed at His holiness. These amazing creatures do not rest, day or night, in amazement at His holiness. They never tire of the holiness of God. They never begin to find it boring. Similarly, only God is Almighty. Everything and everyone else is limited in power, and dependent upon God for their very existence from one moment to the next. And only God is eternal—without any beginning. He just was. It seems to be to this that the elders are responding when they answer, with praise of their own, the praise of the four living creatures. When they hear that God is the only eternally existent being—that He had no beginning at all—they are reminded that He alone is the Creator of all things. Everything literally owes its existence to Him. And that, of course, includes us. There is no honor or recognition or authority that we have, except that which ultimately belongs to Him, and we must lay it at His feet! So, let us learn not only to be impressed with Him, but also (importantly) to be unimpressed with ourselves! Wonderfully, when we look at Isaiah 6:1-10 with John 12:40-41, we realize that this glory that belongs to God alone is actually the glory of Jesus Christ—God Himself who became man to save us! Of what are you tempted to be proud? What is the danger of missing out on who Jesus is and how glorious Jesus is? What activities does He use to humble you about yourself and show you His glory instead? What use will you make of these activities for your own soul? Questions for Littles: Where did Noah go in Genesis 7:7? Who went with him? Because of what? What else went with him (Genesis 7:8)? How did they enter (Genesis 7:9)? Why was it done this way? What happened after seven days (Genesis 7:10)? How does Genesis 7:11 make it plain that this is an historical event? How does it emphasize Noah’s actual age at the time? What does this tell us about other men’s ages of this period, which were similar to Noah’s? How long did it rain (Genesis 7:12)? What do Genesis 7:13-15 emphasize about how long it took to enter the ark? Who are named in Genesis 7:13? What else entered with them (Genesis 7:14)? How did they come onto the ark (Genesis 7:15)? What was in them? Who had commanded this (Genesis 7:16)? Who shut them all in the ark? How long did it rain (Genesis 7:17)? What did the increased waters do to the ark? Where did it rise? What does Genesis 7:18 say about the waters? What did the ark do in Genesis 7:18? What does Genesis 7:19 say about the waters? What were covered? What does Genesis 7:20 say about the waters? What were covered? Which flesh is first mentioned as dying in Genesis 7:21? Who are mentioned last in Genesis 7:21? 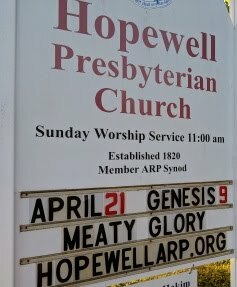 What body-part does Genesis 7:22 mention? Of what does this remind us (cf. Genesis 2:7)? How does Genesis 7:23 restate Genesis 7:21-22? What does it add at the end? What does Genesis 7:24 say about the waters? How long did they prevail, before they even began to recede? In the Scripture for this week’s sermon, we saw God saving sinners. Well, we certainly saw God punishing sinners—an entire world of them—with destruction in the flood. But that was no surprise. What was surprising is that for eight sinners, God was saving them! For the eight sinners of Noah, God commanded a method of salvation, which Noah obeyed (Genesis 7:9). For the eight sinners of Noah, God shut them in the ark where they were safe (Genesis 7:16). For the eight sinners of Noah, rather than trapping them in destruction, the waters lifted them out of it (Genesis 7:17). For the eight sinners of Noah, in the midst of God’s wrath, God remembered mercy, and they remained alive (Genesis 7:23, cf. Habakkuk 3:2). Here is a picture of what happens to sinners through faith in Jesus Christ. Jesus is a Mediator better than Noah—all who belong to Him are safe for His sake from the wrath of God at the judgment. Jesus is Safety better than the ark—all who are found inside Him are lifted into heaven instead of being destroyed in Hell. Jesus is the great Substitute. He suffered Hell on the cross—the Just one died for the unjust! We’re all sinners. The great question for us is whether we are clinging to Jesus as God’s salvation for us! When will you leave this life? When you do so, will you do so safely in Jesus?